THE BEST TEMP FOR YOU: If you’re using the same-temp water for green tea as you are for your coffee, you’re missing out: The ideal water temperature brings out the best flavors. With the Epica 6-temperature kettle, every drink you make can be a little closer to perfection. COOL-TO-TOUCH HANDLE: Safety first! When things get hot, the Epica kettle handle stays cool to your touch. Our Cooltouch handle protects your fingers from accidental burns. And if the water boils out and the kettle starts running dry, it automatically shuts off. Perfect for homes with young children. 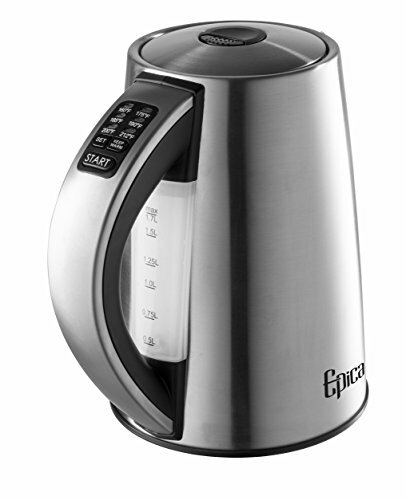 PROGRAM WITH EASE: The Epica kettle has a thirty-minute keep-warm button. It also has a two-minute setting memory that’s lightning fast to use, so your water is ready at the temperature you want whenever you need it. FOR WHEN YOU’VE ONLY GOT ONE FREE HAND: We make kettles with you in mind. With a lid that automatically opens just when you need it to, a 360° rotating base for easy one-hand grabbing, and our perma-cool handle, we put a lot of thought into the Epica kettle so you can pour … without the worry. TWO YEAR WARRANTY: This kettle is made with the highest quality materials. If you have any problems in the first two years, we’ll replace it free of charge. Good Try Epica! A perfect electric kettle is difficult to find, and I would probably have to continue my search after this Epica model. Great Kettle for Tea! As a tea (not coffee) drinker, I have loved having an electric kettle. I also prefer stainless steel to plastic for many reasons. Unfortunately, over time the lids have failed on everyone. Using it once to four times a day may be a factor.